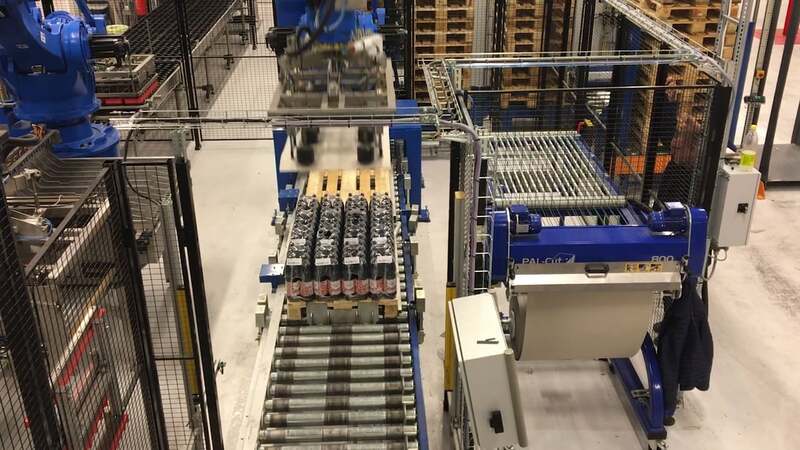 Halewood International, the UK’s largest independent beverage producer, has recently installed four new fully automated packaging lines for approximately 100,000 pallets per year. The opportunity was taken to simultaneously integrate four PAL-Cut sheet dispensers in the palletizing area. In this way, there are no more dropped liner sheets, the volume of offsite waste has been reduced by 66%, and the work of refilling interleaf sheets in palletizing is significantly reduced. Halewood saves labor and overhead costs by installing PAL-Cut sheet dispensers equipped with Antim65® non-slip paper. Packaging is presented better and waste is reduced. “It was not necessary to develop a comprehensive business calculation of the amortization period. The 66% offsite waste reduction alone convinced management that the installation of four PAL-Cut arch dispensers for the interleaving sheets is a great investment, “said Philip Goulborn, project manager at Halewood in Liverpool. The investment is part of the plan to double its size within five years. With the ambitious goal of reducing waste and increasing onsite and offsite recycling. The new facility includes four new Lita palletizing lines, a packing station and conveyor systems in the brewery facilities in Liverpool. 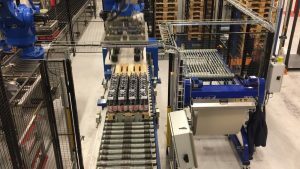 The fully automatic palletizing lines work with various packaging such as six-packs, bottles in boxes, etc. The products are stacked on Euro or CHEP pallets, after palletizing the pallets are conveyed to the general packing station by conveyor belt and finally transported almost 250 m further to the warehouse. So far, the intermediate layers that were placed between the product layers on the pallets have been critical. The magazine with cardboard liners had to be replaced every 30 minutes. This happened with a forklift and was quite laborious and time consuming. Another topic was the “journey” of the pallets, where the transport cart brought the pallets from the palletizing lines to the common packing station. Here, the better pallet stability was immediately evident. The installation of an automatic PAL-CUT for each of the four palletizers has significantly increased results. Each Antim65 ® liner sheet is individually cut and ejected so that the robot can only take a single sheet of Antim65 ® non-slip paper, without falling bows, as it may pick up multiple sheets. The magazines with cardboard liners were replaced with PAL-Cut sheet dispensers and Antim65 ® non-slip paper in rolls. The special anti-slip paper coating provides a coefficient of friction> 50, according to standard NFQ 03-083, which is significantly better than most other products available in Europe. The Antim65 ® anti-slip paper is supplied on 2600 m rolls. Thanks to the anti-slip coating, the grammage of only 180 g / m² is sufficient, resulting in much less waste than when using corrugated board. Instead of reloading the magazine every 30 minutes, you only have to replace the roll with anti-slip paper every 4 to 5 hours. This leaves only 46 working hours per year instead of 300 hours. The number of stored intermediate pallets was reduced from 1564 to 138 – a reduction of 91%. A welcome side effect is the almost complete removal of forklift trucks from the packing area, which according to Philip Goulborn has been sought after for many years. After the robot has stacked the products on the pallet, the pallet is automatically conveyed for foliation. This has always been a problem because two to three times during a shift, products such as six-packs fell off the shelf. Then the palletization had to be stopped completely until the damaged products were removed from the ground. “Thanks to the Antim65 ® anti-slip paper, the stacked products remain on the pallet and downtimes are reduced. In fact, since PAL-Cut was put into operation with the anti-slip sheets now in use, there have been no more stops due to dropped products, “continues Philip Goulborn. The trick is to let the next layer of packed bottles slide freely into place when building a pallet. The anti-slip paper secures the bottle layer positioned underneath and holds the packs firmly. Thus, a high pallet stability is achieved before the pallet is packaged. And this also ensures that no more packaging falls on the way to wrapping. We have solved this challenge with the new Antim65 ® non-slip paper. This was developed especially for the beverage industry and ensures stable pallet construction. This could not be achieved with conventional cardboard liners, “says Kelt Emil Jensen. According to him, several years of development work has been invested in this solution and the special anti-slip paper. At the Liverpool plant, waste has been reduced by 21 tons, as 1426 pallets of liners need now be delivered to the factory. “The successful installation at Halewood continues to strengthen the capabilities of the PAL-Cut system and the potential of many beverage industry manufacturers to reduce their waste and optimize equipment output and pallet stability. And without significant expenses or major changes to existing assets, “says Bernard Sellars, Business Development Director at Halewood.